Meet Amanda Sweet who joined our staff in August as a Library Reader’s Advisor for our Talking Book and Braille service. Amanda was born in Milwaukee, WI and was raised in the small town of St. Francis, near Lake Michigan. She graduated with a bachelor’s degree in English with an Emphasis in Publishing from Carleton College. After a brief stint with a literary agency in New York City, she decided to veer away from the making of books and shifted to the circulation of books in the library. As long as she is near a book, she is happy. 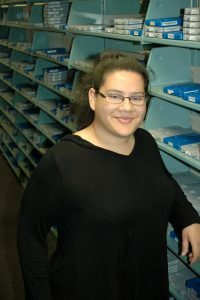 It was while working for Beyond Vision, a nonprofit that employs 85% blind and visually impaired individuals, that she began her Masters in Library and Information Science at the University of Wisconsin- Milwaukee. At Beyond Vision she heard tell of some difficulties in raising awareness for TBBS services and she decided it was time to get more involved with the service as a whole. Here at the Commission, she loves the personal interaction she gets with patrons and will be completing her degree in December. If all else fails with the library career, she will content herself as a professional Dorito taster. Amanda is a lifelong user of libraries and generally has at least one book in her oversized purse at all times. Some of her favorite authors include Sherman Alexie, Patricia Briggs, Dean Koontz, Richelle Mead, and many others. In her spare time she makes jewelry for the Etsy site she shares with her father- Sweetwater Creations. She lives with her boyfriend Sean and, since their move, they both have a craving for Oakland Gyros Greek Restaurant back in Milwaukee. The silver lining is that Amanda loves the people here in Lincoln as well as the new bead store/ art gallery she stumbled upon. Ideally, she would spend her entire weekend holed up with a gyro while reading, watching movies, making jewelry, and mindlessly surfing the web. We are grateful Amanda has joined us. This entry was posted in General, Public Relations, Talking Book & Braille Service (TBBS) and tagged Amanda Sweet, Nebraska Library Commission Staff, New Faces, NLC Staff, Reader's Advisor, Staff, Talking Books, TBBS. Bookmark the permalink.